Group shot of all the volunteers on the Visitors Center terrace. We rely on support from our community to make the Arboretum a one-of-a-kind space for nature, education, recreation, and volunteerism. 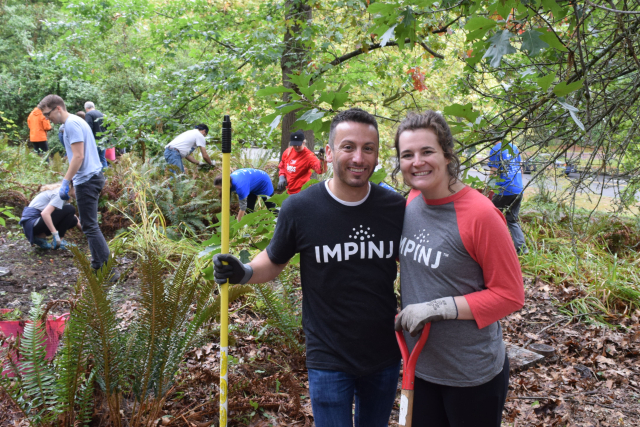 And some truly special volunteerism took place during this year’s United Way of King County Day of Caring on Friday, September 14, when 220 people showed up to work on weeding and mulching projects all around the park. The volunteer crew were comprised of employees from seven local companies—Microsoft, Amazon, Nordstrom, AT&T, Sonos, Impinj, and D.A. Davidson—plus a number of individual partcipants. 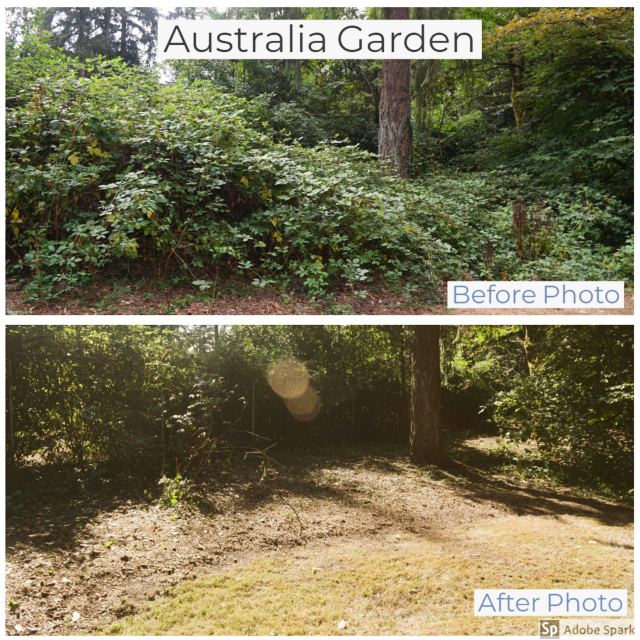 The Arboretum Foundation helped coordinate the volunteers, while the horticulture staff of UW Botanic Gardens and Seattle Parks and Recreation supervised the projects. We were simply blown away by the dedication of these volunteers and how much they accomplished. Volunteers spreading mulch in the newly created Loop Trail wetlands. In the site of the future Australia Forest, near the Pacific Connections turnaround, a team of Microsoft and individual volunteers worked with UW arborist Clif Edwards to remove roughly six cubic yards of blackberry. Down the hill in the Serviceberry Collection, a group made up of individual volunteers and staff from D.A. Davidson and Microsoft worked with UW horticulturist Darrin Hedberg to remove five cubic yards of blackberry and spread more than 20 cubic yards of wood-chip mulch. 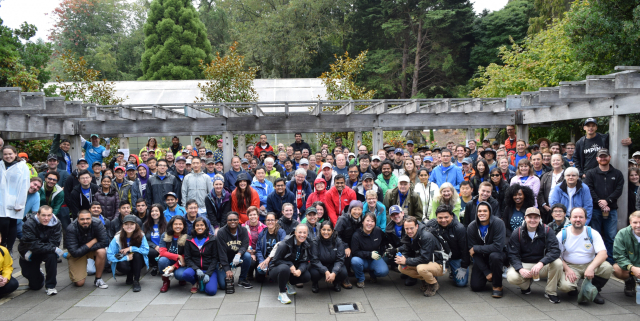 A team of volunteers from Microsoft worked with UW’s Joanna Long to spread 18 cubic yards of mulch in the Gateway to Chile garden, and then pulled four yards of ivy from the peony collection along Arboretum Drive. In the Holly Collection, a large group of Impinj and individual volunteers worked with UW’s Ryan Garrison to spread 30 yards of mulch, pull three yards of weeds, and prune dead foliage from sword ferns. Volunteers removing blackberry from the Serviceberry Collection. 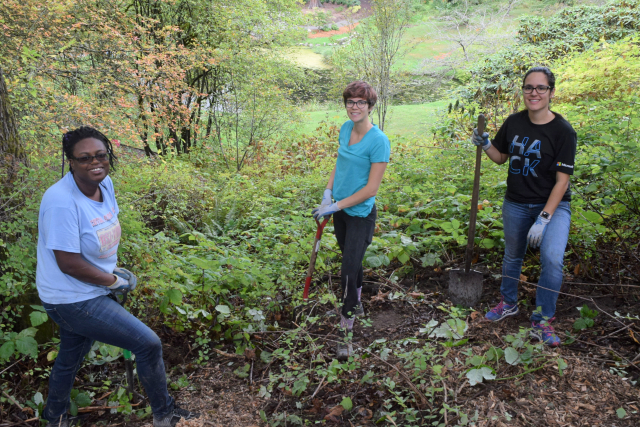 In the newly created wetlands along the Arboretum Loop Trail, Seattle Parks’ Amanda Hannah, Jamy Sok, and Danzell Stevens-Leaai supervised a large team of volunteers from Nordstrom, Amazon, and AT&T. They laid down a full pallet of cardboard (as a sheet mulch) and spread 30 yards of wood-chip mulch around the native plantings to suppress weeds. 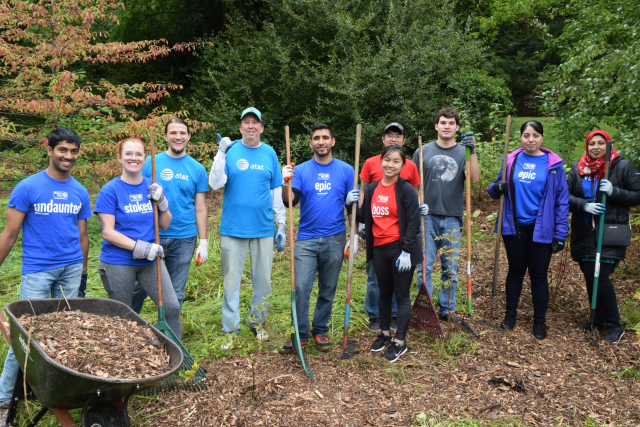 Nearby, along Arboretum Creek, a group from Sonos and Microsoft worked with UW’s Derek Allen to spread 20 yards of mulch and pull a yard of weeds. Close by, in the Pinetum, UW arborist Drew Foster supervised a team of Microsoft and individual volunteers in spreading 25 yards of mulch around specimen trees and removing two yards of weeds from a future planting site by the E. Newton Street entrance to the park. Last but not least, a group of volunteers from Microsoft worked with Seattle Parks’ Don Williams and Karlene Jones to spread 20 yards of mulch along the Waterfront Trail on Marsh Island. The crew also cleared brush and pulled invasive weeds from roughly 50 feet of trail. Volunteers weeding and mulching in the Holly Collection. Thanks to everyone who came out to help renew this beautiful place! You made a huge impact! Indeed, shortly after Day of Caring, a longtime Arboretum visitor and supporter, Linda Lesnick, called us to praise the work. “It looks the best it ever has!” said Linda. Thanks also to Clif Bars Inc and Belle Epicurean for providing snacks and coffee for the volunteers. MORE PHOTOS: See lots more pics of the volunteers/projects on our Facebook page. ← Fall Plant Sale a Big Hit!